In 1869, fruit merchant Joseph Campbell and icebox manufacturer Abraham Anderson started the Anderson & Campbell Preserve Company in Camden, New Jersey. By 1877, the partners realized each had different visions for the company. Joseph Campbell bought Anderson’s share and expanded the business to include ketchup, salad dressing, mustard, and other sauces. Ready-to-serve Beefsteak Tomato Soup became a Campbell’s best seller. In 1894, Joseph Campbell retired and Arthur Dorrance took over as company president. Three years later, soup history was made when Arthur Dorrance reluntly hired his nephew John Dorrance. John held a chemistry degree from MIT and a Ph.D. from the University of Gottengen in Germany. He turned down more prestigious and better paying teaching positions to work for his uncle. His Campbell's salary was only $7.50 per week and he had to bring in his own lab equipement. However, John Dorrance soon made the Campbell's Soup Company very famous. Soups were inexpensive to make but very expensive to ship. Dorrance realized that if he could remove soup's heaviest ingredient water, he could create a formula for condensed soup and slash the price of soup from $.30 to $.10 per can. By 1922, soup was such an integral part of the company presence in America, that Campbell’s formally accepted "Soup" into its name. The Campbell Kids have been selling Campbell's Soup since 1904 when Grace Wiederseim Drayton, an illustrator and writer, added some sketches of children to her husband’s advertising layout for a Campbell's condensed soup. The Campbell advertising agents loved the child appeal and choose Mrs. Wiederseim’s sketches as trademarks. In the beginning, Campbell Kids were drawn as ordinary boys and girls, later, Campbell Kids took on the personas of policemen, sailors, soldiers, and other professions. Grace Wiederseim Drayton will always be the "mother" of Campbell Kids. She drew for the company advertising for nearly twenty years. Drayton’s designs were so popular that doll makers wanted to capitalized on their popularity. Campbell's gave the E. I. Horsemen Company the license to market dolls with the Campbell label on their sleeves. Horseman even secured two U.S. design patents for the dolls’ clothes. In large skillet, heat olive oil over medium high heat. Add chicken and onions, stirring, until browned and onions are tender, about 8 to 10 minutes. Stir in remaining ingredients except parsley. Bring to boil, reduce heat, cover and simmer for 10 minutes. Uncover and simmer another 6 to 8 minutes, stirring occasionally, until noodles are tender. Garnish with parsley. Enjoy! This looks like a great week night meal. Thanks! Hi Christine! Very interesting story about how condensed soup came about. I always learn something new when I visit your blog, which keeps me coming back. I didn't know the whole of that story--I love how your posts always include food history. What a great history of Campbell soups. Skillet chicken noodle looks yummy. A nice healthy recipe in a skillet. Thanks everyone! You and your comments mean a lot to me. It always comes down to money. Love the story. This looks so good, and healthy and warm! Just the kind of dish I need right now. Nice and easy, and very comforting food! Definitely great recipe for a weeknight! Thanks everyone! I just love hearing from you. Great history! and great recipe. I use Campbell's soup in several of my chicken recipes too!! I love the info in your posts!! And the recipe sounds perfect for a chilly winter night! I've never heard of chicken soup being made in a skillet, but it looks amazing! I could use some right now, it's freezing outside and in my house :) Great recipe! That is a COOL history! Thanks! This does look so thick and delicious! I also like the method of preparation-the skillet. Glad to stop in, I can always count on learning something from your posts. Thanks for sharing the background information on Campbells soup! Very interesting story Christine. Thank you for the time you put into research and this skillet meal look delish. Your posts are awesome, Christine! 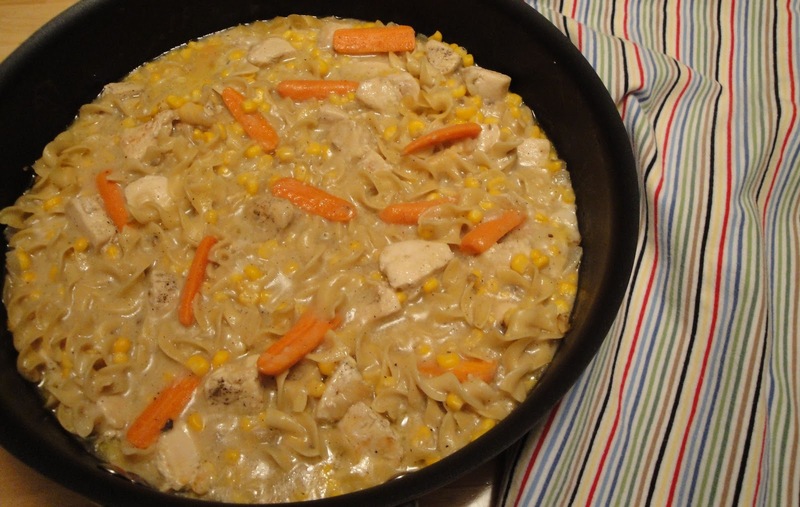 And this skillet chicken noodle looks creamy and delicious! Looks like a delicious, quick weeknight meal! Great meal Christine. I love stuff like this during the week.